Q1. What are the operating/service times of Maokong Gondola? When is the departure time of the last cabin? 1. The Maokong Gondola is closed for regular maintenance every Monday apart from national holidays. 2. From Tuesday to Thursday: 09:00~21:00. 3. Friday and the day before a national holiday: 09:00~22:00. 4. Weekends and national holidays: 08:30~22:00; Sunday and the last day of national holidays: until 21:00. 5. Operating/service hours may be adjusted due to festival events, bad weather or other special conditions. Q2. How much is the fare for Maokong Gondola? A： About the ticket regulations, please refer to Maokong Gondola Tickets & Fares. Q3. Can I use EasyCard to take the Maokong Gondola? A： Place the EasyCard over the sensor of the EasyCard logo at the gate. When it beeps or an arrow shows, the flaps will open to let passengers pass through. Each EasyCard can be used for one passenger only. Q4. How much time does it take from Gondola Taipei Zoo Station to Maokong Station? A： Depending on the system speed, from Gondola Taipei Zoo Station to Maokong Station, the journey takes 17~37 minutes (running speed is 5 m/sec~2 m/sec). Q5. How to get to Gondola Taipei Zoo Station? A： About transport information, please refer to Maokong Gondola Route Map. Q6. What local tourist spots are accessible from Maokong Gondola? A： For more information, please refer to Attractions near Maokong Gondola. Q7. Are there parking lots available close to Taipei Zoo Station? 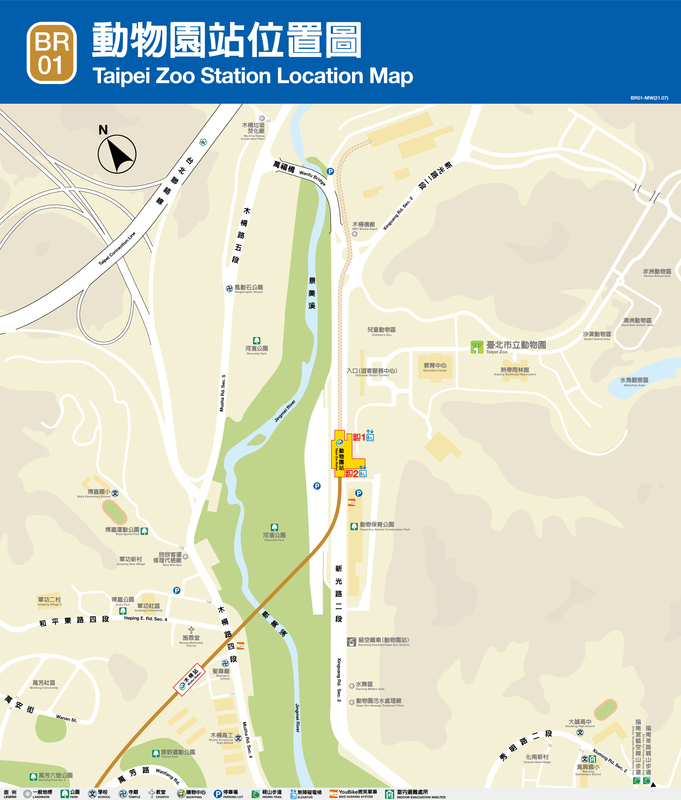 (Please refer to Taipei Zoo Station Location Map) What is the charge for parking? A： 1. Taipei Zoo Station parking lot (underground parking) and parking fees, please refer to Taipei Zoo Station parking lot and parking fees. 2. Muzha Depot parking lot and parking fees, please refer to Muzha Depot parking lot and parking fees. Q8. Why is service suspended in case of thunderstorms? And if service is suspended, when will service return to normal? What happens in evacuation of passengers when gondola operation is temporarily suspended due to thunderstorms? A： When lightning occurs within the area of the Maokong Gondola, the system will be suspended. Passengers will be evacuated to a nearby station and all systems will close down when evacuation is complete. Due to the unpredictable duration of thunderstorms, there is no way to predict how long service will be suspended. If lightning within the warning area does not occur for 30 minutes, the system will undergo inspection and will be back in service after confirmation of operational safety. Passengers within the stations during the thunderstorms will be transferred by free buses to the city. Q9. How long is the Maokong Gondola System? How many stations does it have? A： The Maokong Gondola System is shaped like the number ‘7’ and extends over 4.03 kilometers of hills south of Taipei. It is the first gondola system in the City and has four passenger stations – Taipei Zoo Station, Taipei Zoo South Station, Zhinan Temple Station, and Maokong Station – as well as two angle stations that are not open to the public. Q10. How does the Maokong Gondola System operate? A： The cabines of the Maokong Gondola System have no independent source of power. They are carried along the route on a cable which normally operates in a counter-clockwise direction. The power facilities are located on raised racks in Angle Station Two. Q11. Which organization or department built the Maokong Gondola System? Project management and Construction Supervisor: CECI Engineering Consultants Ltd.
Q12. What's the maximum capacity of the regular cabins and the crystal cabin? Is it safe to take the "Eyes of Maokong Gondola" Crystal Cabins? A： For regular cabins, the maximum loading weight is 640 kg (about 8 passengers); for the crystal cabin, due to the more-than 200 kg transparent floor, the maximum capacity is 5 passengers. "Eyes of Maokong Gondola" Crystal Cabins are modified from the original gondola cabins. The bottom of the original cabin was replaced with tri-layer reinforced glass. The thickness of the glass is about 48mm, weighing 213 kg. All of the Crystal Cabin’s glass floors meet all safety requirements and are CE certified (with CE marking). The installation was guided by POMA’s technicians. Passengers can feel free and safe when riding in "Eyes of Maokong Gondola" Crystal Cabins. Q13. Can passengers have food or drink in cabin? A： Food, drink (except water), smoking, chewing gum and betel nut are not permitted in cabins. Please keep cabins clean and preserve natural environment of the Maokong area. Q14. Why was the "Eyes of Maokong Gondola" Crystal Cabins launch? A： The Crystal Cabin was launched on March 30, 2010; the Maokong Gondola’s reopening date. Since then, the Crystal Cabin has been highly praised by many passengers and received great interest from the public and the media. In order to provide passengers with a pleasant new experience riding the Maokong Gondola, the new version of the Crystal Cabin—"Eyes of Maokong Gondola" was launched officially on November 2, 2010. Passengers not only can enjoy the unbelievable panorama of Maokong, but also experience the sensation of soaring through the sky. Q15. How can I buy the ticket for riding on "Eyes of Maokong Gondola" Crystal Cabins? How much is it? A： If passengers would like to take the "Eyes of Maokong Gondola" crystal cabins, they can use the online booking service before the expected riding date or get a queue ticket on site. On the riding date, passengers can buy tickets on site or use EasyCard to take the Maokong Gondola; please follow the appointed time on the queue ticket and instructions from station staff to enter the station. The fare of "Eyes of Maokong Gondola" Crystal Cabins is the same as regular cabins. Q16. Are "Eyes of Maokong Gondola" Crystal Cabins available everyday? Q17. How frequent does an "Eyes of Maokong Gondola" Crystal Cabin depart from the platform? A： "Eyes of Maokong Gondola" Crystal Cabins and regular cabins are carried along the Cable in a circuit. When cabins move at rates from 3 to 5 m/sec, the "Eyes of Maokong Gondola" Crystal Cabins depart from platform every 2~4 minutes. Q18. Do you have any regulations for taking "Eyes of Maokong "Crystal Cabins? A： In order to enjoy a whole new experience on Maokong Gondola, passengers should follow instructions from station staff when riding on "Eyes of Maokong Gondola" Crystal Cabins. Passengers who have heart disease, high blood pressure, acrophobia, or any other physical/medical conditions that can cause discomfort when riding should NOT ride the "Eyes of Maokong Gondola" Crystal Cabins. Besides, female passengers wearing skirts should avoid standing on the transparent glass and be aware of their sitting posture to protect themselves.